An improved version with full double blooms, outstanding color and more! The beloved native redbud just got better! 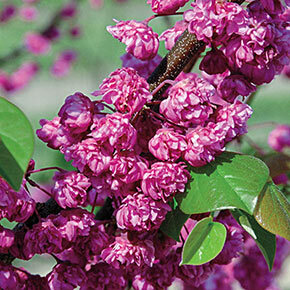 It has outstanding rich purple flower color deeper in color than any other redbud. The double blossoms cover its branches every spring in attractive clusters. Its heart-shaped leaves are extra glossy, providing outstanding summer interest compared with the satin leaf finish on standard redbuds. An added bonus is that this redbud is sterile. This means you won't have unsightly seed pods on the tree in summer or volunteer seedlings to weed in your landscape. This new hybrid is a uniform growing , small tree reaching 10-15' tall after 10 years. So it's an ideal size for today's landscapes. Because redbuds are vigorous and untroubled by disease, drought or poor soil conditions, they're an ideal choice for many landscapes. 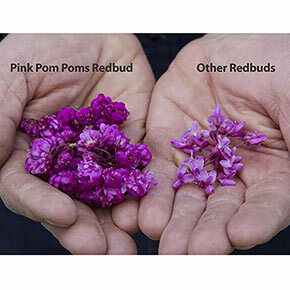 The Pink Pom Poms Redbud is so new we're not sure of the zones, but it's definitely hardy to Zone 6 and quite possibly farther north. Flowers are edible. Zones 6-9. 3-4' bareroot. Cercis x 'Pink Pom Poms' PPAF. Flower Form: intermediate lavender pink flowers borne on bare stems in early spring. Profuse flowering and low pod set. Pruning: Minimal pruning is needed in late winter or early spring.